Fall break is just around the corner and we are in full trip planning mode over here in Magnolia Mama world. And for those of you who just now started back to school and are all like "Fall Break?!?" Yes, we are already on our first full week break. Crazy, huh? Trust me, we think so too. Life lately has been nothing short of overwhelming. This break more than most seems necessary for us to re-energize, and simply just enjoy each other without some of the chaos we have going on. We knew Fall Break was on the horizon, but held off planning anything too serious not knowing if we would be in a position to go too far away. We threw a trip together last minute (as much as a week out can count as last minute), and wanted to seek some input. We are headed to the Myrtle Beach area (although not right in the heart of everything) and neither one of us have ever been. 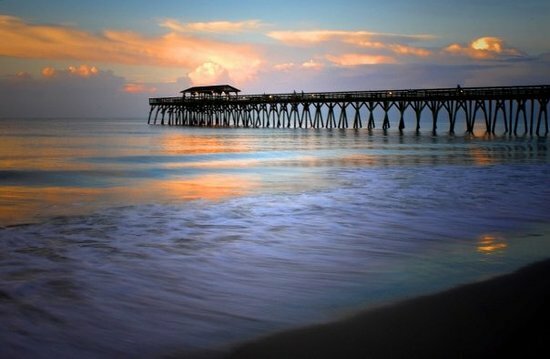 Have you been to the Myrtle Beach area? Let us know! What should we do aside from lounge by the pool and frolic on the beach all day? Lots of frolicking will be occurring though. Lots. It's a prerequisite of taking this crew anywhere. Share your Myrtle Beach secrets with me! What part of Myrtle are you going to? We have a place in Cherry Grove in North Myrtle. Love to go to Barefoot Landing, and then Broadway in the Beach. Both offer themed restaurants and fun activities for the kids. Also, can't miss the putt-putt or kayaking in Cherry Grove. Renting a golf cart for the week is always fun too. Enjoy! Fun! We are definitely going to have to put those on our lists - they sound so fun for the kids. I think we are staying on the northern side of Myrtle.